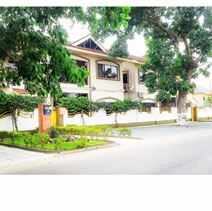 Situated in the business hub of upscale East Legon, this centre is close to banks, shops and more. The centre offers a range of office spaces on flexible terms to meet your business needs. A full selection of business support services is available to clients. The site is easily accessible via public transport and is only a 10-minute drive from the Kotoka International Airport. The centre is also close to several hotels including the MG Grand hotel, Mensvic Hotel, Angehill Hotel, Royal Richester, Erata Hotel, African Regent Hotel and Holiday Inn. Located just 10 minutes from Accra Airport and with fast road links to the CBD this affluent neighbourhood is home to many embassies and multinational corporations. The ground floor business centre provides fully serviced office space. 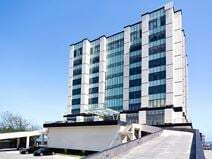 Amenities include; 24 Hour Access, Break-Out Areas, Centre Elevator, Meeting Rooms, Outside Seating Area / Terrace, Sandwich Service, Sky TV, Temp control, Voicemail and 24 hour CCTV monitoring. One of Accra's most distinct addresses this Grade A office space is part of a modern 120,000m² mixed-use project. Easy access to the ministries, the courts, all the major banks and financial institutions as well all the major hotel chains in Ghana. The space is also very close to frequent, convenient local transport services run in the area at regular intervals to take you in and around the city with ease. The centre boasts an abundance of amenities available to tenants including stylish work spaces, a free high speed internet connection, access to meeting & board rooms, elegant breakout areas and a modern interior layout. The space also has a staffed reception area where visitors and corporate guests can be greeted and occupants can make use of the provided administrative services. Tenants also benefit from dedicated security and support, conference calling options and 24-hour access to the space, offered significant working flexibility. This is the perfect workspace solution for businesses that want to flourish in a setting that enhances productivity and efficiency. The workstations come fully furnished and on flexible terms. Occupants can enjoy complimentary use of the well fitted conference rooms, complementary water, coffee and tea, kitchen, balcony space and support from a friendly administration team. The space offers a free on-site car park and public transport is a 15-minute walk away. High-quality serviced offices are available within a landmark tower in Osu, situated between Accra city centre and Kotoka International Airport. Osu is the most popular tourist destination in Accra hence amenities such as restaurants, shops and banks are aplenty. The offices have been recently refurbished to a high standard and it now boasts comfortable desks/chairs and spacious meeting rooms. Dedicated business support services are also available for a nominal charge. One of Ghana’s most sought-after business addresses, this centre is located on the presidential floor of the highly visible Movenpick Ambassador Hotel in the central business district, which gives it excellent international connectivity and access to business opportunities. The centre offers elegant workspace close to government ministries, main banks and financial institutions, organisations such as the British Council and numerous large hotels at the nation’s economic and administrative hub. This newly renovated space has two floors of workspace with a light, airy cafe on the ground floor. All workspaces are furnished with ergonomic chair, desk and have air conditioning. There are a handful of private offices that sit up to 4 people comfortably and hot desking available. The centre is close to Ako, Adjei Park, an exciting up and coming part of Osu with a range of restaruants, shops and hotels all within walking distance. If you're looking for a change of scenery during your lunch break why not take a walk to the local park, only four-minutes away from the office. Opposite Kotoka International Airport and close to both the Kwame Nkurumah Circle and the Presidential Palace this centre is housed in a striking building that is Ghanas first environmentally certified commercial building. The centre has a range of working spaces on offer, including virtual offices, serviced offices and meeting rooms. Working areas can be fully customised to suit particular preferences and requirements. There is an on-site support team available to provide personalised assistance and a range of management services. Strategically located in the business district of Accra, these office spaces are elegantly furnished and are provided with air conditioning, telecommunication systems and reception area. These offices are surrounded by famous hotels, restaurants and numerous amenities. Transport links in the area are also excellent, with the building being easily accessible by road and only a short drive to the coast. If you are looking for one of the most sought after business addresses in Ghana, look no further. This rental office in Accra (Ghana's capital city) ticks all the boxes in terms of business facilities and services. Top-of-the-mark workstations, high speed broadband access, state-of-the-art video conferencing studio and fully equipped meeting rooms are all readily available, expertly supported by a multi-lingual team. The international airport is only 10 minutes’ drive away whilst other amenities such as embassies, banks, hotels and restaurants are just around the building. The space offers flexible solutions to meet any business requirement at a great value, as well as all-inclusive price for your convenience. With multiple office-types and meeting rooms to suit a multitude of business needs, this centre is ideal for any company looking for a prestigious business location on the Senchi Loop, behind the Association International School at the Airport Residential Area. Located within the airport residential area, this centre offers elegant corporate office suites, with flexible occupancy terms to suit the needs to businesses big or small. It is accessible at all hours of the day, and has an administration team on-site to help tenant operations run as smoothly as possible. There is meeting room provision, lounge spaces and secure parking. The airport is a short drive away, perfect for international contacts or businesses that value outstanding connectivity. With a 360-degree view of the city this three-storey building on the Sphintex Road overlooks the industrial area, just five minutes from the Coca Cola roundabout. All the flexible office space is furnished while longer term clients (90+ days) can customise their space. 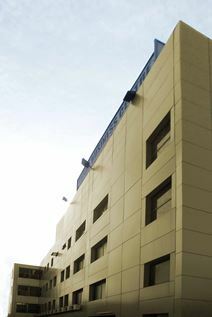 The centre provides secure parking, 24-hour security, 4G internet, a backup generator and on-site storage facilities. 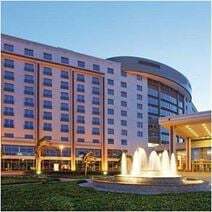 Just a short drive away, you can reach several hotels at which to accommodate visiting clients and executives, as well as Kotoka International Airport, just 10 minutes away.